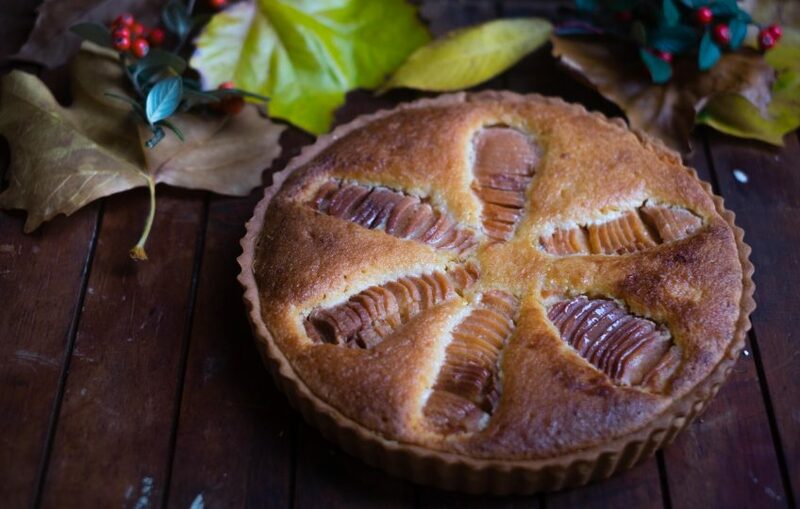 This quince frangipane tart has appeared quite a lot on my social media over the last few days. Mainly because I had to make it twice, because I dropped the first one all over the oven door. 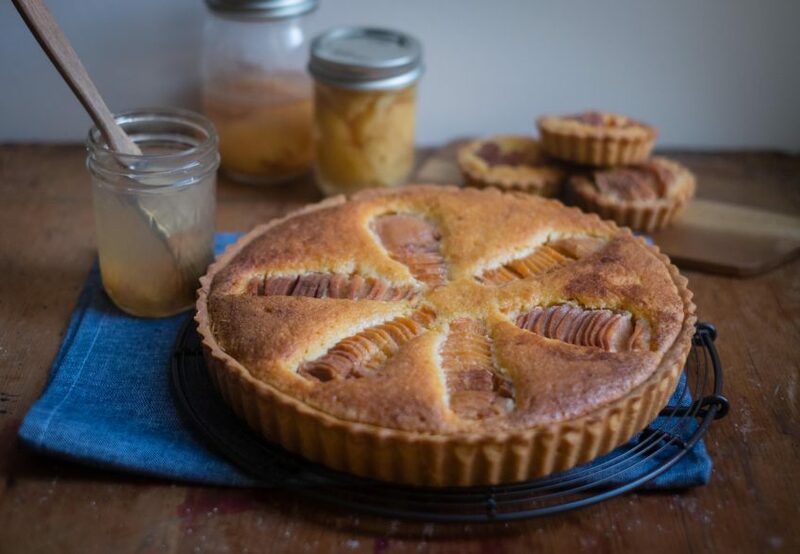 I made quite possibly the most beautiful tart with quinces I had poached using this recipe by Bojon Gourmet. Everything was going perfectly in the kitchen, it was 11pm and the lovely looking tart came out of the oven, I decided it needed another 10 minutes and when I returned it to the oven the loose-bottom tin flipped up and emptied the contents everywhere. Thankfully I had made twice the amount of pate sucree I needed, I had jars and jars of poached quinces from this bumper crop, more ginger curd and due to an error with a delivery, lots of extra bags of ground almonds. So instead of giving in, I made the tart again and I’m so pleased I did, because it’s really, really worth it! The first time I made the quince frangipane tart I made 8 mini tarts that I filled with this delicious Fortnum & Mason rose petal jelly. I’m undecided which is my favourite, the ginger or the rose so feel free to experiment with different flavours for the curd/jam layer. 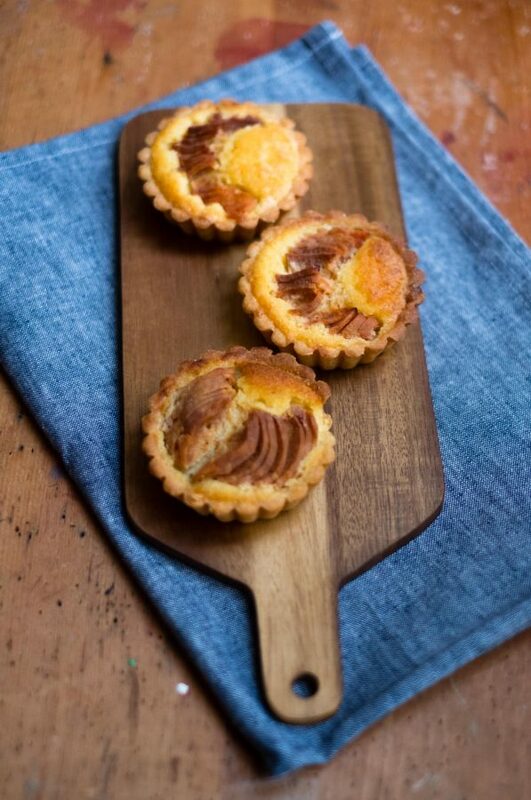 This tart is really easy to make, just be sure to chill your pastry before baking and the rest is very simple. The quinces I used in this dish came from my boyfriend’s mum’s garden. They smell amazing, I got so many kilos, some I pureed to use later for membrillo, others I pickled and then finally I poached a batch. I love this time of year with all of these ingredients around, the sloes will be ready soon, I have some in the freezer which I’m going to turn into sloe gin very soon. 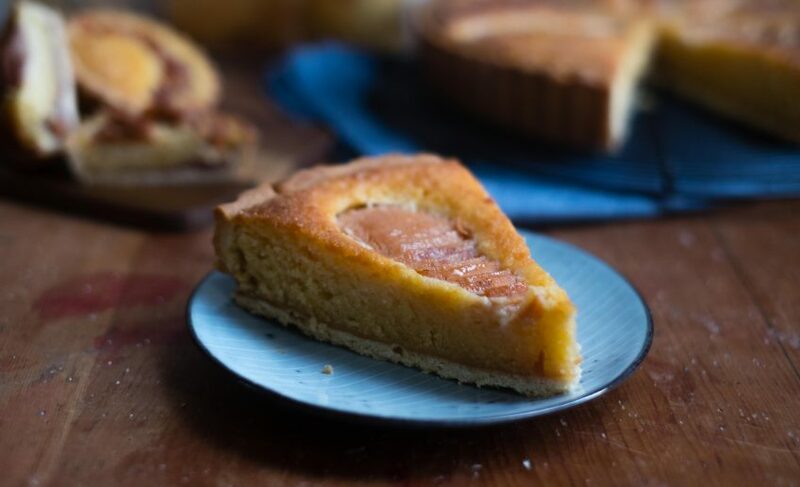 This is a delicious tart filled with warming ginger curd and topped with a moist frangipane and the most amazing poached quinces. 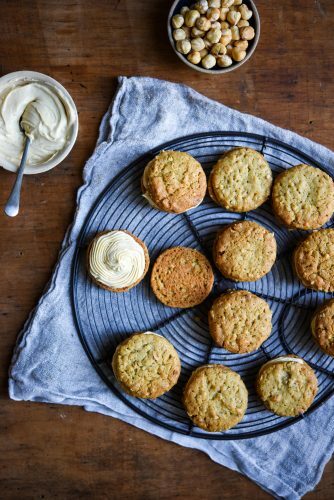 Place the butter in the bowl of a stand mixer fitted with the paddle attachment and beat until soft and smooth, add the icing sugar and cream the ingredients together until light and smooth. Gradually mix in the eggs making sure they become fully incorporated, add in the flour and salt and mix till it becomes one big mass. Turn the pastry out on to a work surface, mix it all together and then shape it into a block, cover with cling-film and refrigerate the pastry for 30 minutes to an hour. 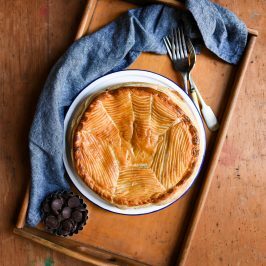 Roll out the chilled pastry on a lightly floured work surface and line a fluted tart tin 27cm in diameter, about 3cm deep. 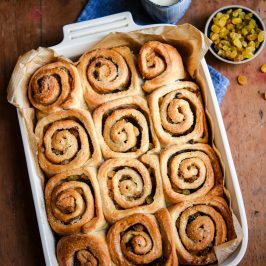 Spread the ginger curd in a thin layer on the base of pastry and chill for a further 30 minutes. Make the filling, cream the butter and sugar together, then gradually add the beaten eggs. 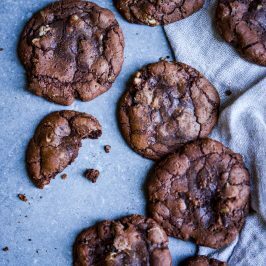 Scrape down the sides of the bowl with a spatula, add the ground almonds, flour and almond extract. Mix for a few seconds until well incorporated. 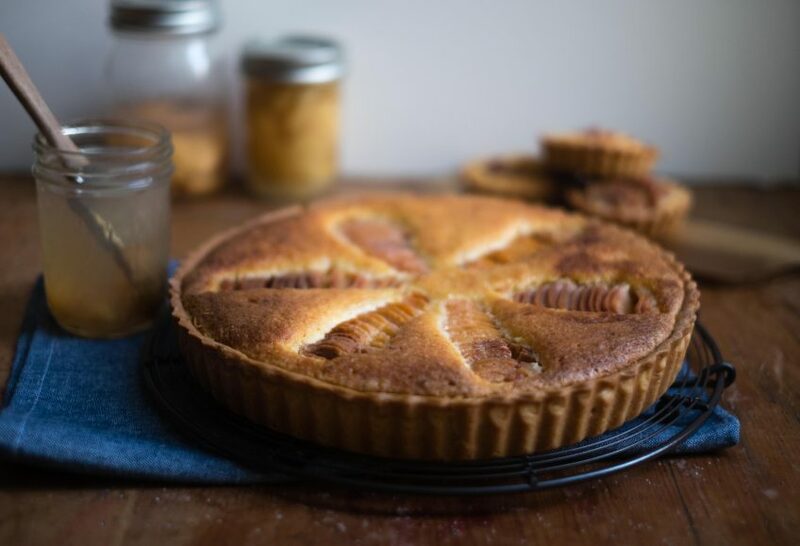 Take the chilled pastry case from the fridge spread the frangipane evenly over the curd and take the 6 quince halves and slice them thinly crossways. Take the quinces and place them on top of the tart, with the smallest end facing inwards, fanning them out slightly. Preheat the oven to 190C/170C Fan/gas 5. 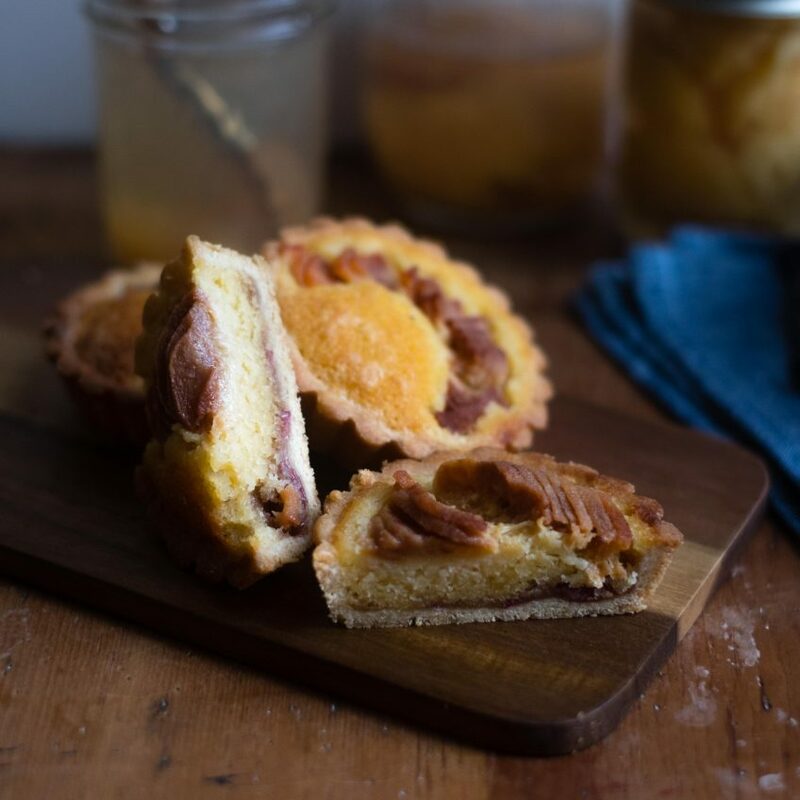 Place the tart on the tray and bake for about 45–50 minutes until the almond filling and pastry are golden brown. When you remove the tart from the oven, glaze it with the leftover poaching liquid from the quinces using a pastry brush. 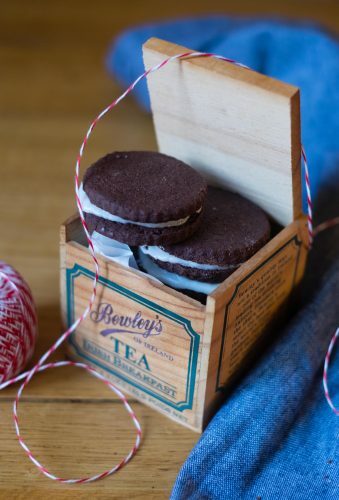 Serve warm with clotted cream or leave to cool. ***To poach the quinces I used the recipe here on Bojon Gourmet's blog. 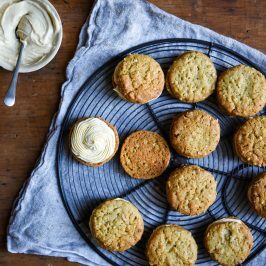 ***I used ginger curd from The English Provender Company. If you don't want to use ginger curd or you can't get hold of any, you can use rose petal jelly - I used this in the mini tarts, or you can leave it out entirely. 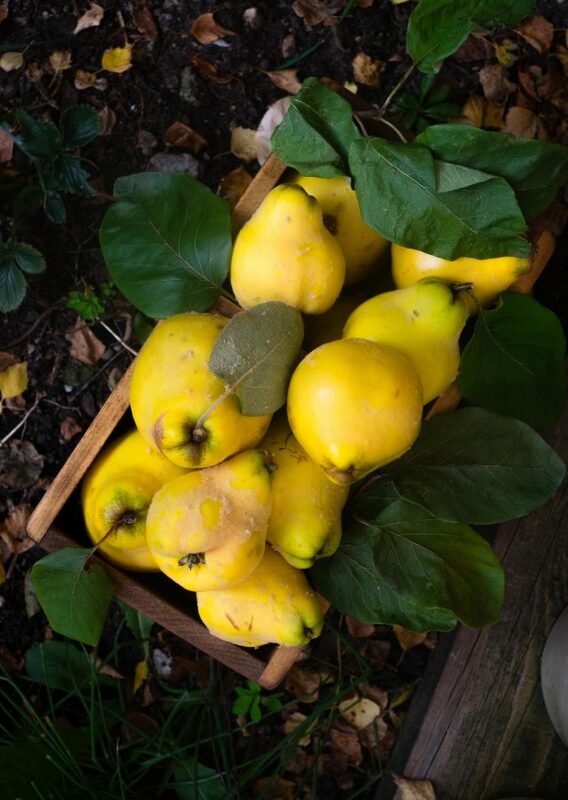 I still have a couple of jars of quinces to use up that I might include in a crumble with an oaty topping. Do you like quinces? If so, what do you do with yours? 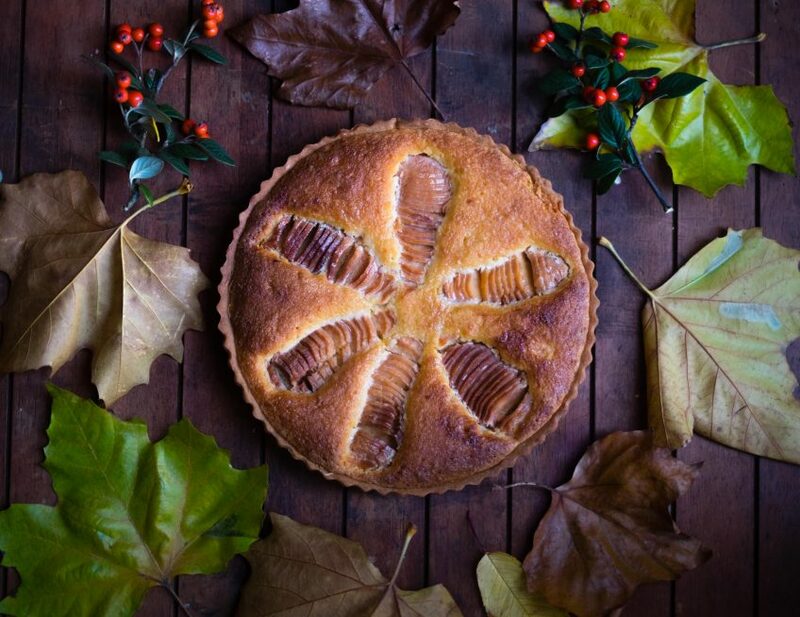 This tart looks absolutely stunning! I can already smell how quinces and almonds match heavenly. Well done Angela! So strange, I had never even heard of a quince before until earlier this week while watching the Holiday Baking Championship show on Food Network. 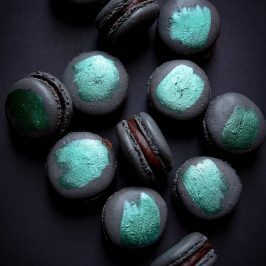 Several of the bakers had used them and the judges loved them. I’m assuming it’s related to the pear? At least it looks like it. Your tart looks lovely and I sympathize with your tart dropping. Last year my mom dropped her pumpkin pie while taking it out of the oven. Omg, the mess! Quinces can be hard to get hold of even here Jodie. They are like a very hard pear with a very floral taste. 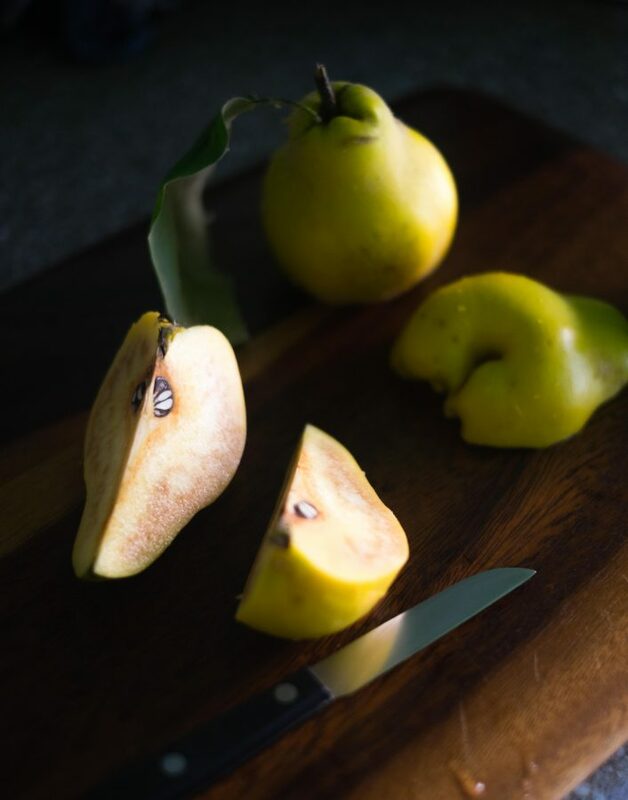 They have the texture of a pear when poached, but they have a lot more flavour. I feel so sorry for your Mum, I still haven’t managed to get all of it out of the nooks and crannies of the oven door! This is beautiful! Glad you made it again after dropping the first! Amy after tasting some of the remains I knew I had to make it again! It looked so pretty. Thanks for commenting. 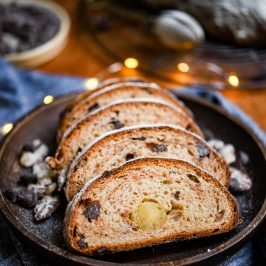 This is one of my favorite desserts, love that you added ginger to it! Quince and ginger go together so well, I never knew until I did some research to make this. So glad you like it! This looks sooo good. 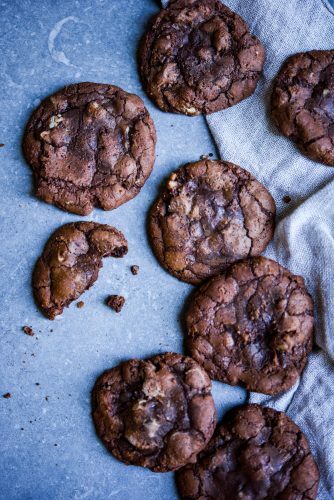 Lovely photos 🙂 Thanks for sharing the recipe. Thank you Natalie – so pleased you liked the photos, it can be really hard to photograph something so brown. The recipe is great. Do give it a try! I’ve had quince jelly before, and find it most appealing. Your tart looks amazing. Loving the sounds of the flavours. If it’s any consolation I once dropped a very important birthday cake from a sprung tin. Oh Helen – I completely sympathise with you. I was devastated, I’ve learnt to be a bit more careful in the kitchen now though. This looks delicious Angela, I adore frangipane tarts. I’ve never been able to get my hands on any quinces, maybe when we finally get round to doing up our garden I’ll plant a tree so I can grow my own. Quinces can be really elusive Hannah. I’d never even heard of them until I came across the tree in my boyfriend’s mum’s garden. She included them in her crumble and they were so good. You really need to get hold of some, I think a tree with take a while, some markets and shops do have them. Glad you like the tart, I love frangipane too, so much. 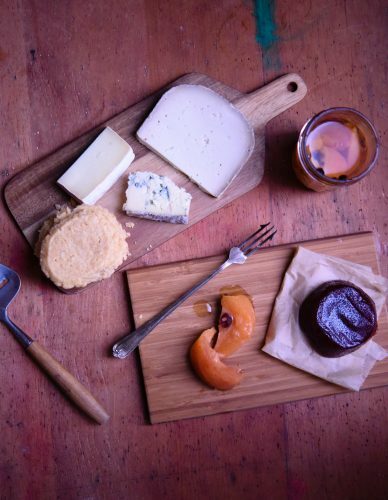 Quince jelly and croissant ( + coffee) is pretty unbeatable. If I have too much jelly ( is it possible?) it adds a lovely fruity sweetness to red wine sauces as well as providing some lip-smacking texture. Quince jelly sounds amazing Steve – is it like membrillo? I don’t think I’ve ever had quince jelly, just quince jam and membrillo. If you did have some spare it would be great in this tart. It sounds wonderful and I have a couple of batches of quince puree in the freezer.